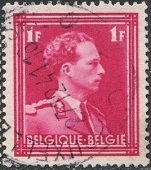 Definitive Belgium stamps, beginning in late 1934, were issued with the profile of the newly crowned King Leopold III. The accession of the new king required the re-issue or replacement of all the existing King Albert I definitive postage stamp denominations. Some of the definitive postage stamp designs of 1934-1938 would even continue to evolve well into the post-war years. The three definitive stamps shown above were issued in 1934 and 1935. 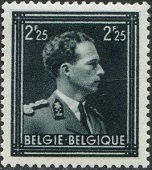 These new stamps all feature the portrait of King Leopold III. 70 C. (1935 - Scott #262) - Olive Black. 75 C. (1934 - Scott #263) - Brown. 1 F. (1935 - Scott #264) - Rose Carmine. Tête-bêche pairs and booklet panes of four stamps + 2 advertising labels exist for the 70 C. denomination. 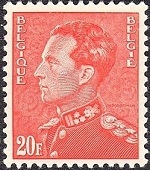 Beginning in 1935, a new series of lower denomination Belgium stamps was introduced. 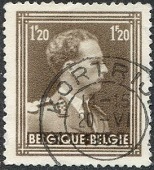 These stamps all feature the Belgian Coat of Arms as their central design, and they are all typographed. Some of these denominations have multiple shades. 2 C. (1937 - Scott #265) - Green. 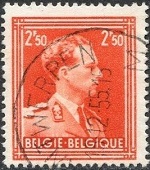 5 C. (1935 - Scott #266) - Orange. 10 C. (1935 - Scott #267) - Olive Bister. 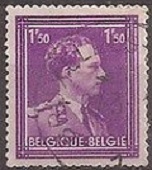 15 C. (1935 - Scott #268) - Dark Violet. 20 C. (1935 - Scott #269) - Lilac. 25 C. (1935 - Scott #270) - Carmine Rose. 25 C. (1946 - Scott #271) - Yellow Orange. 30 C. (1935 - Scott #272) - Brown. 35 C. (1935 - Scott #273) - Green. 40 C. (1938 - Scott #274) - Red Violet. 50 C. (1935 - Scott #275) - Blue. 60 C. (1941 - Scott #276) - Slate. 65 C. (1946 - Scott #277) - Red Lilac. 70 C. (1945 - Scott #278) - Blue Green. 75 C. (1945 - Scott #279) - Lilac Rose. 80 C. (1948 - Scott #280) - Green. 90 C. (1946 - Scott #281) - Dull Violet. 1 F. (1945 - Scott #282) - Red Brown. The 10 C., 25 C., and 35 C. denominations exist in tête-bêche pairs and in booklet panes of four stamps + 2 advertising labels. 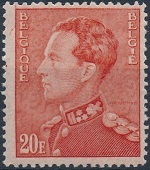 Beginning in 1936, another new series of definitive Belgium stamps was introduced. 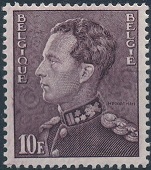 These stamps all feature the right-facing profile of King Leopold III as their central design, and they are all photogravure. 70 C. (1936 - Scott #283) - Brown. 1.00 F. (1936 - Scott #284) - Rose Carmine. 1.20 F. (1951 - Scott #285) - Dark Brown. 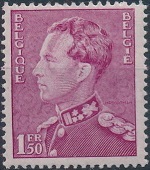 1.50 F. (1943 - Scott #286) - Red Violet. 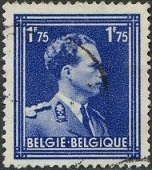 1.75 F. (1943 - Scott #287) - Deep Ultramarine. 1.75 F. (1950 - Scott #288) - Dark Carmine. 2.00 F. (1943 - Scott #289) - Dark Purple. 2.25 F. (1943 - Scott #290) - Greenish Black. 2.50 F. (1951 - Scott #291) - Orange Red. 3.25 F. (1943 - Scott #292) - Chestnut. 5.00 F. (1943 - Scott #293) - Deep Green. The 70 C. denomination exists in tête-bêche pairs and in booklet panes of four stamps + 2 advertising labels. 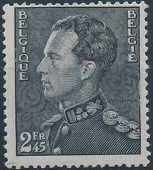 Also beginning in 1936, yet another new series of definitive Belgium stamps was introduced. 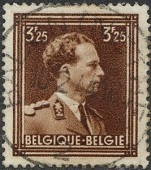 These stamps all feature the left-facing profile of King Leopold III as their central design, and they are all engraved. 1.50 F. (1941 - Perf. 14 x 13 1/2 - Scott #294) - Rose Lilac. 1.75 F. (1936 - Perf. 14 x 13 1/2 - Scott #295) - Dull Blue. 2.00 F. (1936 - Perf. 14 x 13 1/2 - Scott #296) - Dull Violet. 2.25 F. (1941 - Perf. 14 x 13 1/2 - Scott #297) - Gray Violet. 2.45 F. (1936 - Perf. 14 x 13 1/2 - Scott #298) - Black. 2.50 F. (1940 - Perf. 14 x 13 1/2 - Scott #299) - Olive Black. 3.00 F. (1951 - Perf. 11 1/2 - Scott #304) - Yellow Brown. 3.25 F. (1941 - Perf. 14 x 13 1/2 - Scott #300) - Orange Brown. 4.00 F. (1950 - Perf. 11 1/2 - Scott #305) - Blue on Bluish, Blue on White. 5.00 F. (1936 - Perf. 14 x 13 1/2 - Scott #301) - Dull Green. 6.00 F. (1951 - Perf. 11 1/2 - Scott #306) - Bright Rose Carmine. 10.00 F. (1936 - Perf. 14 x 13 1/2 - Scott #302) - Violet Brown, Light Brown. 10.00 F. (1951 - Perf. 11 1/2 - Scott #307) - Brown Violet. 20.00 F. (1936 - Perf. 14 x 13 1/2 - Scott #303) - Vermilion, Rose Orange. 20.00 F. (1951 - Perf. 11 1/2 - Scott #308) - Red. 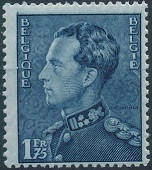 The revalued stamp shown above was issued in 1937. 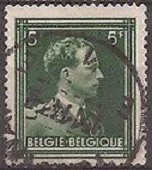 The overprint device is a precancel with the revaluation built into the cancellation device. 10 C. on 40 C. (1937 - Dated 1937 - Scott #309) - Red Violet. 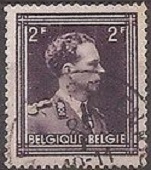 The two small-sized definitive Belgium stamps shown above were issued between 1938 and 1941. 75 C. (1938 - Scott #310) - Olive Gray. 1 F. (1941 - Scott #311) - Rose Pink. Both of these denominations exist in tête-bêche pairs and in booklet panes of four stamps + 2 advertising labels. 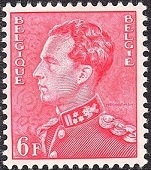 The six stamps shown above were re-valued between 1938 and 1942. 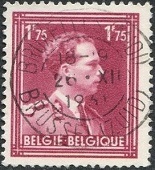 The four stamps shown above were issued on October 31, 1938 (Scott #318-321) to publicize the Liege International Water Exposition of 1939. 0.35 F. - Basilica and Bell Tower. 1.00 F. - Water Exhibition Buildings. 1.50 F. - Albert Canal and Park. 1.75 F. - Eygenbilsen Cut in Albert Canal. 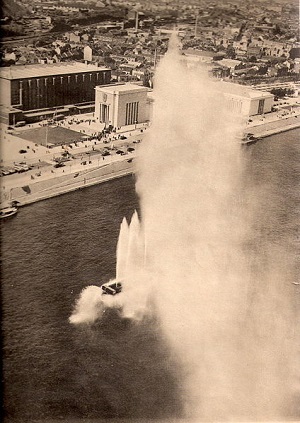 The International Water Exhibition was scheduled to take place at Liege, on the Meuse River, from May 20, 1939 to November 1, 1939. The theme of the exhibition was water management, and the celebration of the July 30, 1939 opening of the new Albert Canal. On August 31, 1939, the Belgian Army destroyed two bridges crossing the Meuse River to prevent the German advance, in case of war. The exhibition was closed on September 1, 1939, and on the following day, Germany invaded Belgium.